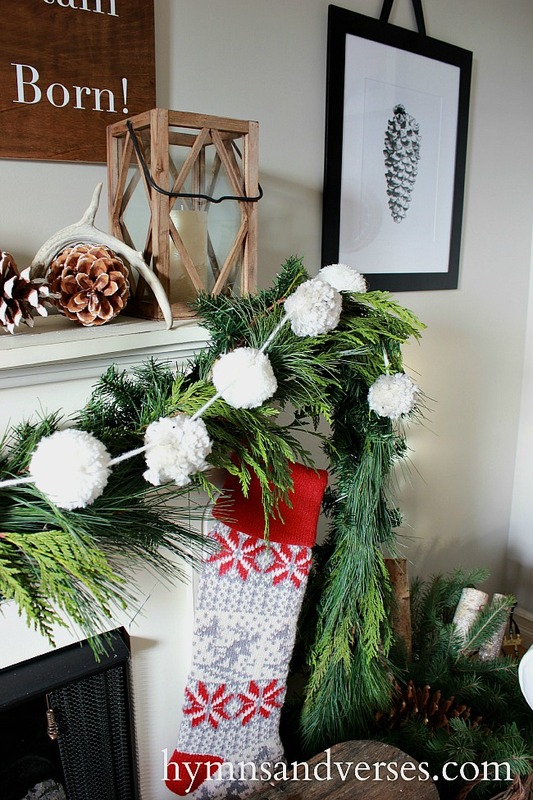 Welcome to Part 1 of my Home Tour featuring my Christmas Living Room! If you are here visiting from Claire Brody Designs, thanks for popping over! Wasn’t Claire’s home fabulous! Before we begin, I want to say “thank you” to Marty from A Stroll Thru Life for putting this tour together! When you come in our front door, this winter gallery wall in our living room is what greets you! I had so much fun creating this gallery wall. It all started with a pair of skis from the 1920’s that I found on Ebay. I’ll be sharing a detailed post about the gallery wall later this week. Another fun piece is the DIY wooden sign hanging above the fireplace. I wanted to create a statement piece for that spot with lyrics from a Christmas carol or song. 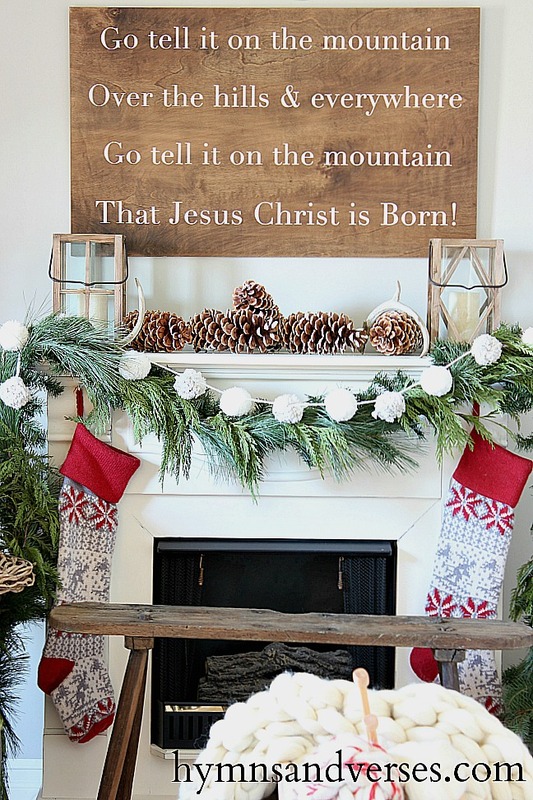 “Go Tell it on the Mountain” brings the true message of Christmas into my lodge style decor. I love how the wood grain from the sign warms up the room. In front of the fireplace is a primitive bench that I purchased two years ago. It was covered in an ugly green paint and has been up in our attic waiting for the right time to be made over. When I first saw the wooden skis in person, I decided to add more rich wood tones to my Christmas living room. I stripped the green paint off the bench to reveal the gorgeous worn wood underneath. Could these stockings be any more perfect? I found them at the Pottery Barn Outlet. The funny thing is, I didn’t even notice the ski motif until I hung them up on my mantel! I just liked the gray, red and white Scandinavian style. It was a surprising bonus that they actually have skiers on them! A real trend this year is plaid, plaid, and more plaid! I decided to really mix it up with black and white buffalo check curtains and bright red plaids. This year we had fun picking out a freshly cut tree. There’s nothing like the scent from a freshly cut pine tree at Christmastime. The black and white deer and pinecone artwork are vintage etchings that I found over at The Graphics Fairy. The copies came to a total of $.75 at Staples. Simple, classic – super inexpensive art! The prints are available in my FREE Printable Library for email subscribers. If you don’t already receive my posts in your email inbox, you can sign up HERE. Once you sign up, you will receive a password to access the printable library. 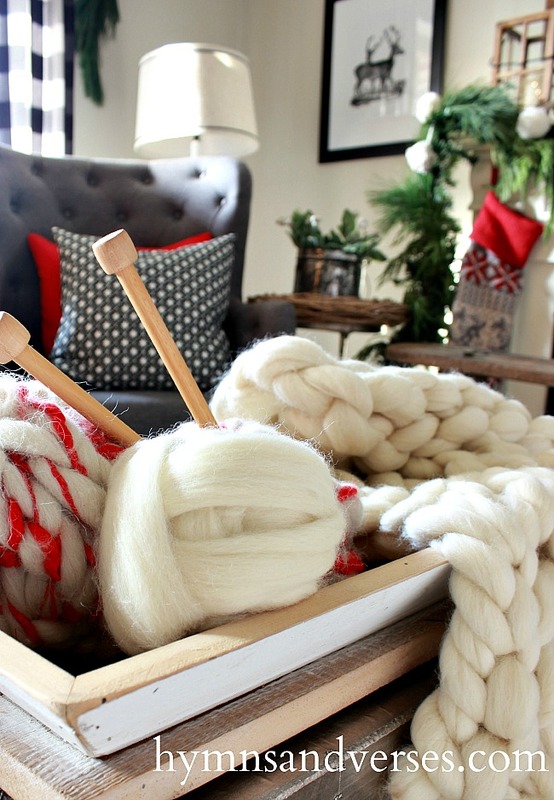 Another element you will see repeated in my Christmas living room is wool. 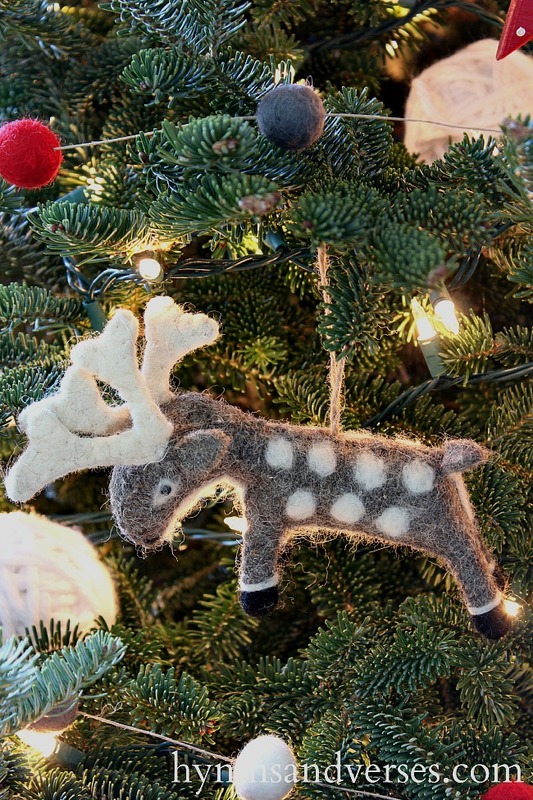 The large, wooly throw I knit from wool roving and many of the tree ornaments are also wool – woolen reindeer, polar bears, a felted wool ball garland, and yarn balls. 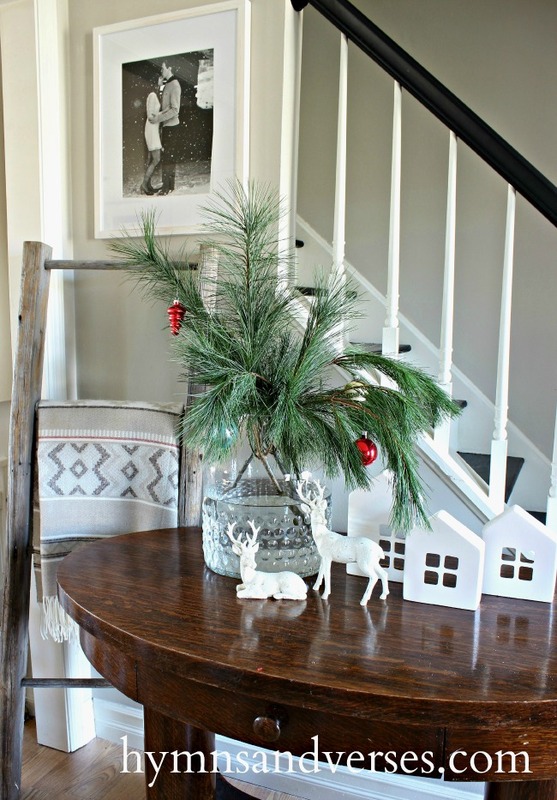 Pine and cedar roping was draped over each window in the living room – adding more of that fresh pine scent. The library table was moved over by the staircase to make room for the Christmas tree. 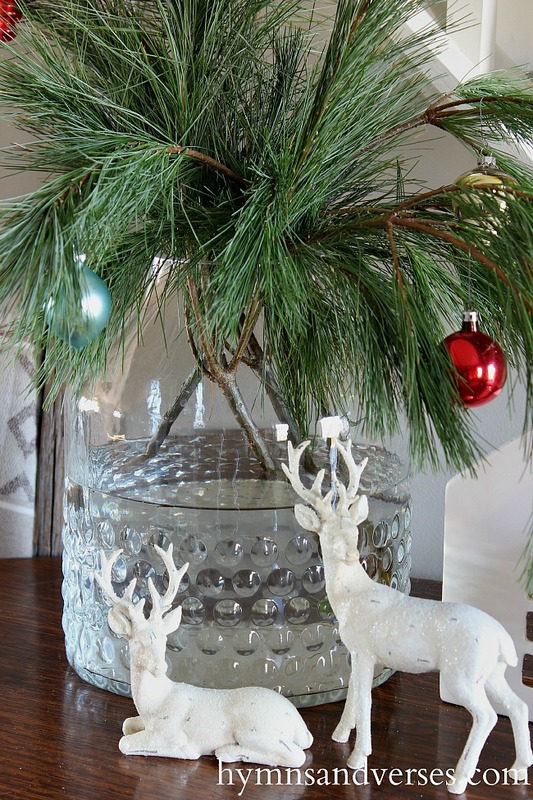 I used a large glass jar of white pine branches with some white reindeer and simple white house silhouettes to dress up the table. Last evening I shared my screen porch with s’more and hot cocoa station! You can see more HERE. Thanks for stopping by for Part 1 of my Christmas tour! Part 2 is tomorrow featuring my dining room and kitchen. Next up on the today’s tour is Jenna from Rain on a Tin Roof! Here are the other stops on this week’s tour! Love your plaids and checks and I love your country ski motif. Stunning. That gallery is amazing and all of your decor is so perfect. Makes me think of a fabulous lodge in the mountains. The porch is wonderful with it’s cocoa station too. So pretty. Absolutely stunning! My Facebook readers are going to love all that I’m sharing with them. 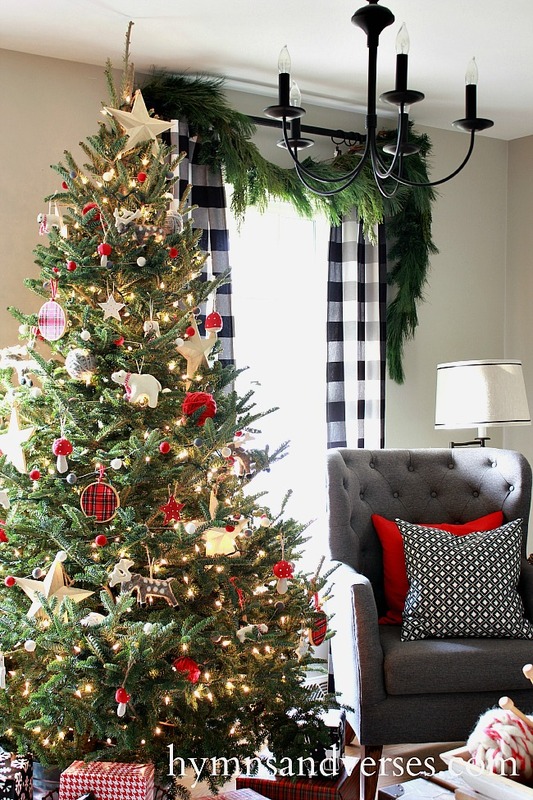 Love the use of all the plaid! Merry Christmas! I’m all about plaid this season so naturally I’m a big fan already. I really love your wood sign – that’s one of my favorite hymns. But the real showstopper is that knit throw! WOW – so beautiful! Darlene as usual you have created a truly delightful scene. If you ever decide to sell your lovely knitted blankets please know that I am first in line. Lovely truly. I love your ski lodge decor! But that wool throw is awesome!! I really need to learn to knit 🙂 Gorgeous home Doreen!! Absolutely smashing, Doreen!! I love the plaids, the swags, and the wood tones. It looks like Christmas comfy at the lodge! When can I book a room?? Gorgeous! Love the plaids and the antique skis! I would love to know how you made the large picture of people holding hands? Everything is beautiful! I love the mantel and the ski lodge decor. 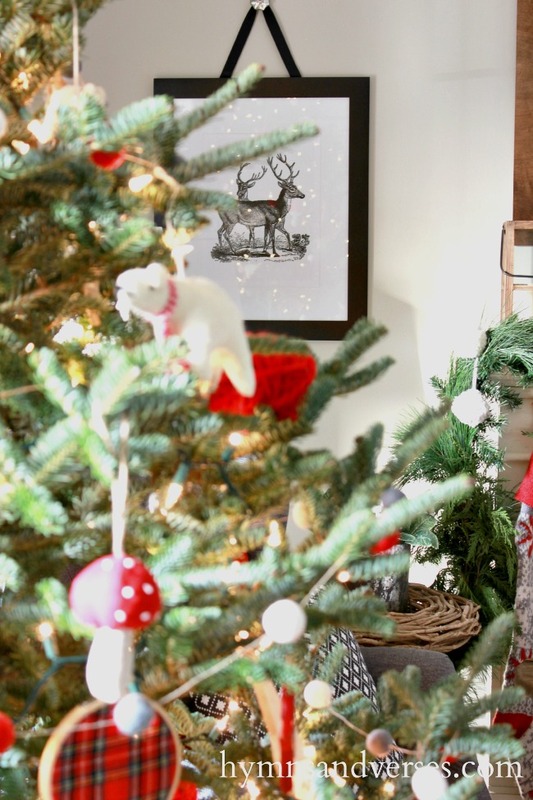 Doreen, I love it all…the gallery wall, the mantel, and that tree! You add such cute details everywhere! Seriously crushing on your color scheme, Doreen. So pretty, and all of your handmade items are so perfect. Love being on tour with you, Merry Christmas!! Doreen, Your home is just beautiful! 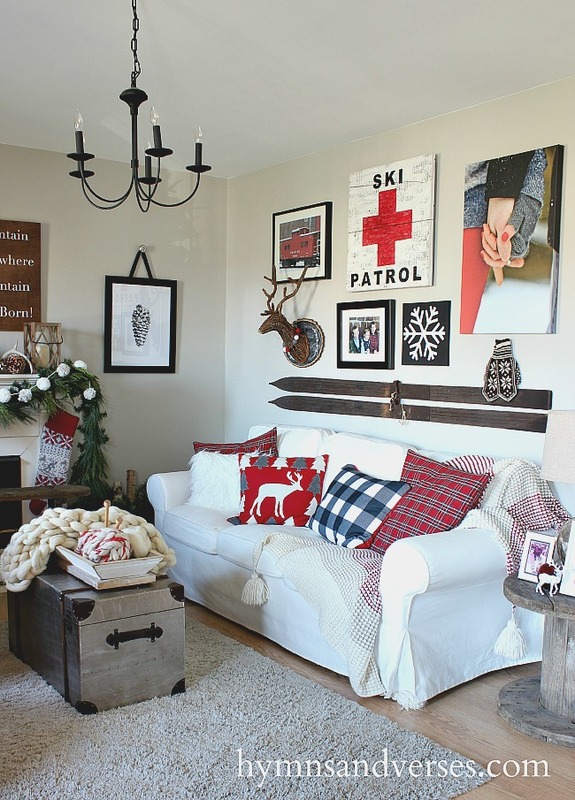 I love all the details you add all around, the vintage skis, the gallery wall, the wool ornaments and throw…Love it all! Your garland over your windows is just stunning – goes so perfectly with your drapes! Thanks so much, Alicia! It was fun being on the tour together! Merry Christmas! WHAT AN INCREDIBLE SPACE YOU’VE CREATED! 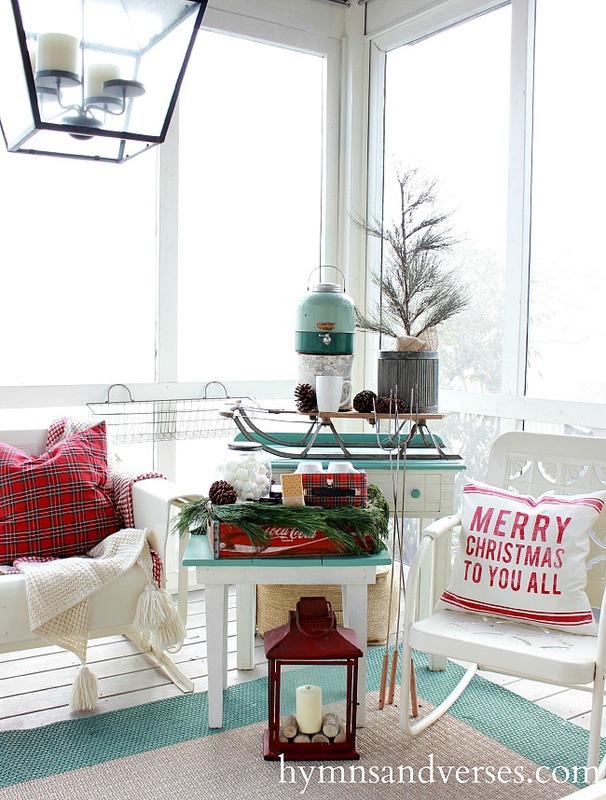 So cozy and inviting – just lovely! Thanks so very much, Lacey! Merry Christmas! Love every single detail. 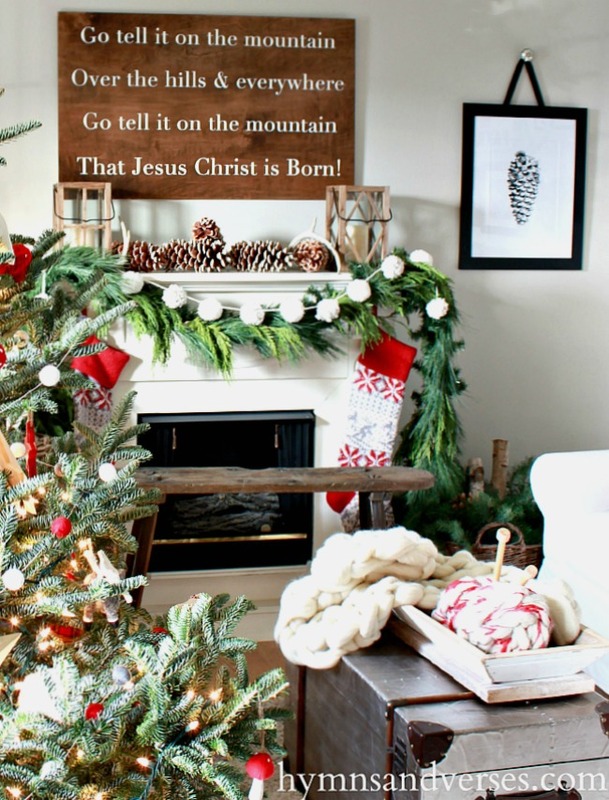 The plaid, the gorgeous tree, and especially the sign above the mantle. Perfect for this time of year. Thanks so very much! Merry Christmas! Hi Doreen, oh how I love this room, all the red/black/white fits together perfectly. The outdoorsy ski theme is so much fun. And of course I think your sign is the best!! thanks for joining in! Thanks so very much, Debra! Wishing you a very Merry Christmas!! 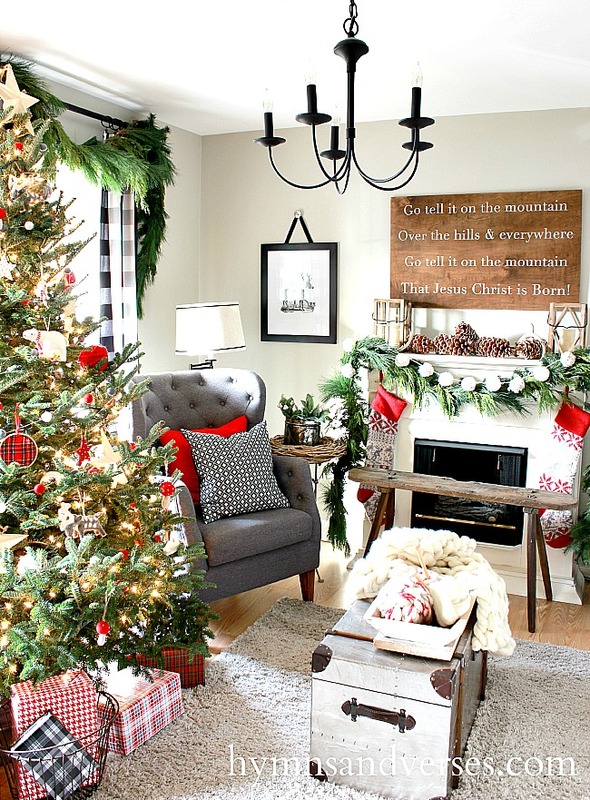 I love what you have done with your home for Christmas! It is just beautiful, comfortable and cozy. I’m off to Part 2, and then to check out your Etsy shop! Where did you find the buffalo check curtains? Good to know about Ikea. You can also get buffalo check fabric on fabric.com and onlinefabricstore.com. I have made 2 sets of panels in red and soft blue from fabric purchased at these sites. There are lots of colors available. Hope that helps. Ha! Here it is 2017 and I’ve just caught up with you again. Thank you for the pinecone print out. Love your tutorials on the framed tea towels. Blessed new year to you, Doreen! OMG!!! 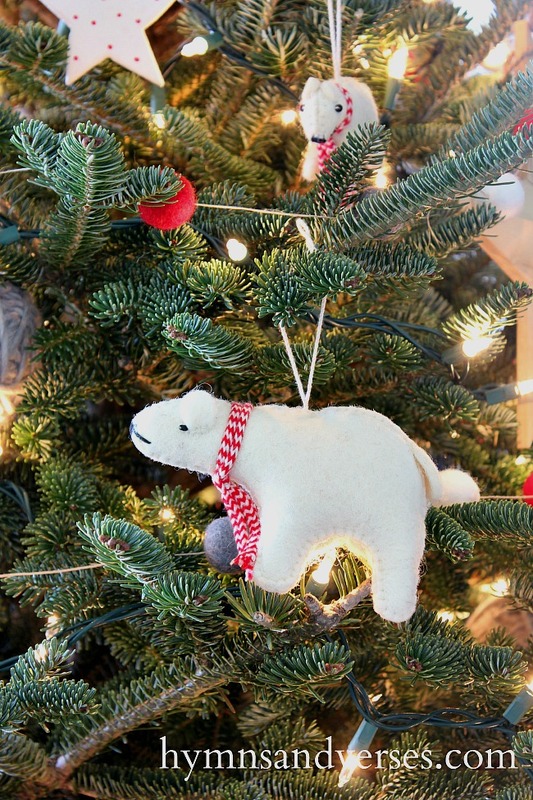 Dying over that Christmas tree – absolutely GORGEOUS!!! Please please tell me exactly what kind of tree is that??? My husband handles our tree & does OK but if I just knew exactly what type of tree to tell him – maybe our tree could be so incredibly beautiful too! Help please!!! Thanks so much! It’s a Frazer Fir tree. We just picked ours out for this year! You can’t go wrong with a Frazer!